Designed to be easy to aim and draw, even for first time archers. This 4.4 lb compound bow has an adjustable draw weight of 55 to 70 pounds. It should be noted that the manufacturer of the SAS Rage compound bow is not as well known as other companies. Choosing a compound bow can be difficult, even for experienced archers. There are several models to choose from, and each often claims to be the easiest to draw and aim. If you are searching for an accurate and powerful bow, the Rage from SAS might be exactly what you are looking for. One of the first aspects to consider is the design of the bow, since this will affect how accurately you can aim and shoot your arrows. This compound bow might be slightly heavier than similar models, but it does come with a durable construction that can withstand countless hours of misfires during practice sessions. The limbs are constructed from durable and inexpensive fiberglass and feature a parallel design. The aluminum riser is machined to provide a smooth base to rest and aim your arrow, and this compound bow also features a dual eccentric cam system. The aluminum cams are durable, and make it extremely easy to adjust the length of the draw. How a bow performs will ultimately determine how well you can aim and hit a target, and even though the SAS Rage is designed for novice archers it is able to provide you with a smooth and consistent performance. The dual eccentric cams let you stop the draw at a comfortable weight, simply move the pin up or down a hole. The aluminum cam system also helps to ensure a smooth draw for more accurate shots. The draw weight can also be adjusted in 5 pound increments up to 70 pounds so you have plenty of power to make a clean kill shot. With a maximum draw rate of 70 pounds this compound bow can generate enough power to be used for target practice and small game hunting. While it also has a maximum speed of 270 feet per second, it should be noted that this compound bow should only be used for hunting if you are capable of repeated 70 pound draws. Otherwise your shot won’t have the power it needs to penetrate skin and bone for a quick and humane kill. Even if you are just using a bow for backyard target practice you still want it to be quiet when fired. This is extremely important to consider if you are planning on using a bow for hunting, since the last thing you want to do is startle your prey with a loud noise. Noisy draws and releases can also throw off your aim, along with that of those around you. The SAS Rage is not extremely loud, but there are quieter and more expensive bows. The minor problem with vibrating strings can be easily resolved with an inexpensive dampening kit. Designed to muffle noise and vibrations, you will find it easier to line up your next shot. Another advantage of adding a dampener is its ability to stabilize the string to ensure a smooth and accurate shot. This compound bow features a sleek and stylish design that will make even novice bowmen look like a professional archer. The aluminum riser not only provides a place for you to rest your bow, it also features unique cutouts that give it a slightly “waffled” look. 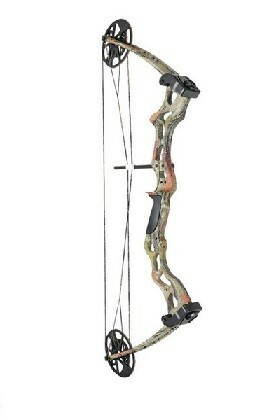 Hunters will appreciate the camouflage design on the limbs and riser that help the bow blend into the surrounding area. The bow also features a design that is easy and comfortable to hold, which is especially important for beginners who are still learning how to handle the bow. If you are looking for an inexpensive compound bow that is designed for beginners this might be exactly what you need. It features a durable aluminum, fiberglass and plastic construction that can withstand being used repeatedly by novice archers, including misfires that might break the stings on other bows. The parallel design limbs help to provide plenty of balance and support, and it is layered to give the bow added support on heavy 70 pound draws. You will also appreciate the dual eccentric cam system that lets you mark a comfortable draw weight for your next shot. You will appreciate having plenty of power behind your shots, and with a maximum speed capacity of 270 feet per second you can easily line up a shot with fast moving prey. It also features a stylish design that will not make you look like an amateur, even if you really are one. The riser has plenty of cutouts to give it a sleek and modern look that is only highlighted by the camouflage detailing. Measuring 35 inches in length and with a 30 inch draw weight, this compound bow is the perfect choice for beginners of all ages. While SAS might not be a well know company yet, they are well on their way with the affordable Rage compound bow. It should also be mentioned that this 70 lb bow also seems to perform best with 30″ aluminum or carbon arrows.